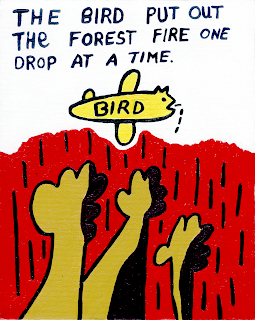 The bird put out the forest fire one drop at a time. Wow. Whatever could have been the source of inspiration for that sketch? It reminds me of a Fogelberg song that says forever is like the time it takes for a bird to come once every 1,000 years to sharpen its beak on the highest point of the Himalayas. A illustration of the Kimster's persistence! H.